Why the SKR camping cookware is a must for your outdoor activities? 1. Portable: Foldable handles, frying pan and soup spoon can be folded to save space. Thus can be stored together in a mesh bag for convenient carry. 2. Non-stick: This camping cooking set makes cooking and wash easily and quickly. 3. Durable: Build with non- toxic anodized aluminum, solid and light. It conducts heat quickly and is survival gear that is built to last. 4. 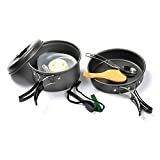 Enjoyable Camping Experience: Cookware Mess Kit provides you a funny and enjoyable cooking experience when camping with families and friends.